Because we specialize in designing superior steel building systems, you are guaranteed expert knowledge and the most current and relevant advice for your project. Armstrong Steel's Building Experts have extensive knowledge of steel buildings, the construction industry and the erection process, so you can be assured that you're getting the most out of your experience with us. While most rigid framed pre-engineered metal buildings are similar in design and function, there are a lot of places to cut corners. Money and weight can be saved in numerous areas including; primary framing, secondary framing, bracing, panel gauge, finishes, and fasteners. 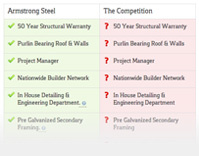 Armstrong Steel takes pride in having the absolute best building system available today. BAR NONE. Per the ASCE 7-10 the American Institute of Steel Construction steel members are designed to carry a very specific load. It is up to the sealing professional engineer to determine what percentage of the max load each member will support in the building system. As a standard, Armstrong only loads to 80% of design maximum. The end result is a stronger, heavier building that is more capable of surviving extreme weather events. Many companies looking to cut corners will design to 100% or even 110%, resulting in a lighter (and therefore cheaper to manufacture) building. It is buildings like these that fail in heavy snow or wind events. Think their "warranty" will cover a failure due to snow, wind, or earthquake? Guess again! Read the fine print. Building warranties only cover structural defects, like cracked welds due to "normal" conditions not 50 or 100 year storm events. Detailing is the process of designing each structural piece of steel, ensuring purlin and girt clips line up to the corresponding punch patterns in the secondary framing and calculating material quantities like screws and closures. Armstrong Steel details all buildings in house at our corporate office in Greenwood Village, Colorado, not in India like so many of our competitors. Our detailers work together as a team, all speak the same language and report directly to the executive staff. Armstrong refuses to work with contract detailers because quality and accuracy are rarely concerns with overseas design firms. The benefit to our customers is they're able to call and speak directly to the engineering team and detailer that has intimate knowledge of their project. Armstrong will not leave a wall inadequately braced. Regardless of what other companies may tell you, panel shear bracing (using wall panels as lateral bracing), torsional bracing, or strap bracing is never sufficient, ever! If cable or rod bracing will not work in a side wall due to openings, Armstrong will use a portal frame to supply the necessary bracing. If a rigid frame is needed in an endwall, Armstrong won't lessen it's building with a rod to frame brace. You will receive the necessary iron to do the job right! As soon as you make the first call to us, our friendly and helpful specialists are on hand to serve you at a personal level. We work with our clients one-on-one in order to answer questions for each customer's unique situations and ensure that you understand your options, costs and timeline. In fact, the Better Business Bureau has recognized our commitment to providing outstanding customer service with an A+ Rating honoring our companies commitment to exceptional business practices and service to customers. Armstrong Steel's highly trained specialists are on hand throughout the entire building process to make each step as simple and hassle-free as possible. Our goal is to ensure you're in your building as quickly and easily as possible while serving as your guide to navigating the complex world of construction. Armstrong Steel uses state-of-the-art technology and military grade security to ensure your personal information is secure. Our CRM system keeps your information organized and accessible only by those who need it to serve you.